For those not already familiar with the company’s products, Fohhn sound equipment is entirely designed and manufactured in Germany, with rigorous quality controls and an effective service infrastructure designed to meet the needs of audio professionals, which goes a long way to mitigating its premium price tag. 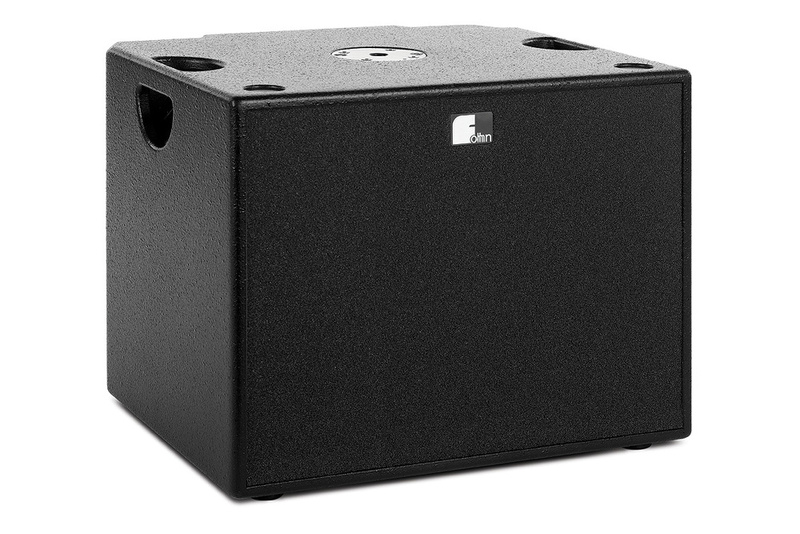 Unlike most active systems, the Fohhn XS series places all the active electronics, including amplifiers, in the sub enclosure where the main speakers are passive. Being a fan of powerful but compact and lightweight PA systems, I decided the time had come to upgrade the older XS20 12–inch sub, which I use with my Fohhn Linea LX100 line–array speakers, to the newer XS22 version. Though I already have an XS30 15–inch subwoofer that works perfectly with the LX100s, it is overkill for many of the smaller venues I frequent. The XS22 is a little larger, heavier and more powerful than the XS20 it replaces, and as well as incorporating all the necessary amplifiers, DSP and crossover capabilities, it now has the current set of XS-series features. These include a preset–based speaker–management menu, where the user can select from a range of main speakers in mono or stereo, and the ability to power an additional passive sub. Incorporating a new long–throw 500W 12–inch speaker, the XS22’s enclosure measures 520 x 420 x 430 mm and weighs a still manageable 25kg. It fits easily into a hatchback alongside other gear, though I’d recommend the optional padded cover for transport. Its ported enclosure is beautifully engineered from birch ply and finished in a tough, textured, scuff–resistant paint (black in this case, but other colours are available to order). Side handles are cut into the wood rather than bolted on so there’s nothing to rattle. A threaded pole-mount is fitted to the top panel, and there are feet on the bottom to protect the base. Driver protection is via the usual perforated metal grille fronted with acoustic foam. The recessed metal rear panel houses all the connectors, and also includes a small back–lit LCD display with push–button cursor controls and a data encoder knob used for speaker selection and parameter adjustment. Note that the power input is on a Powercon connector, not an IEC connector, so it would be prudent to buy a spare cable as most small music shops don’t stock them — and many I’ve visited haven’t even heard of them. A switch for ground lift is provided. The feeds to the passive main speakers are on standard Speakons, and the stereo signal input and thru connections are on XLRs, though the input XLRs are the combi type that can also accept balanced or unbalanced jacks. 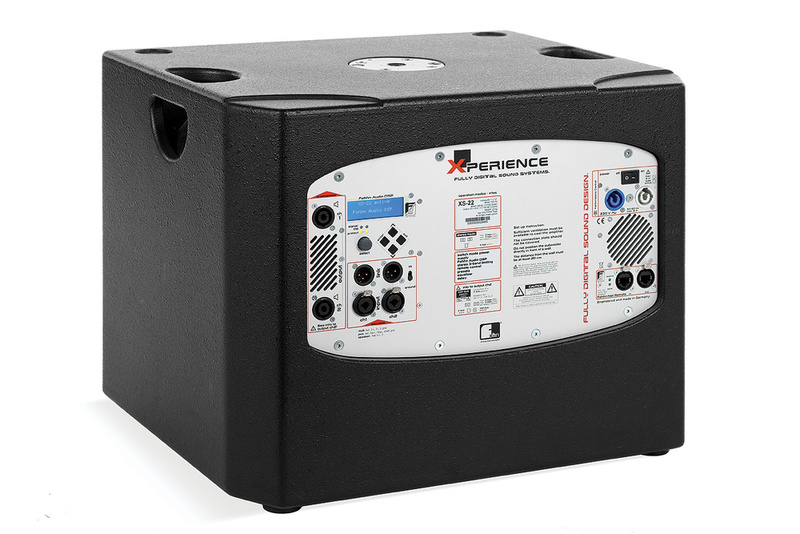 With a total of 1500W of Class–D amplifier power on board, driven via a switch–mode power supply and with full electronic protection, the sub covers the frequency range from 38 to 130 Hz and produces a maximum SPL of 127dB, which is not unimpressive for such a compact unit. In fact I’ve used 18–inch subs that weigh twice as much as the XS22 but produce less in the way of SPL and don’t go significantly lower in frequency. Fohnn have also incorporated what they call their ‘Non–turbulent symmetric port’ design, or NTSP, with the aim of reducing port noise and port compression. Thanks to the on–board DSP with its library of speaker parameters, the XS22 operates in a similar way to its larger siblings, where the crossover and limiter parameters for the relevant Fohhn tops, including my own Fohhn Linea 100 LX–series line–array speakers, are set automatically when the main speaker type is selected from the menu. The menu also includes a range of generic settings for third–party passive main speakers of different sizes and power ratings. It is also possible to adjust the sub level relative to the main speakers via this control section, and to feed the mains in mono or stereo depending on the system configuration. Though a passive subwoofer, such as the Fohhn XSP22, may also be connected and powered from the XS22 in addition to a pair of passive mains, it would need to have integral crossovers as there is no high–pass line–level output. The internal crossovers feed only to the internal power amplifiers used to power the tops, though Fohhn also offer a range of stand-alone amplifiers incorporating DSP speaker management. All XS–series subs can have their firmware updated via an RJ45 port to add new main speakers to the onboard library as they become available, while remote adjustment is possible using Fohhn’s own Audio Soft control software. To accommodate this facility there are two RJ45 ports (in and thru) on the rear panel. Note that while the connectors are RJ45, the data protocol is Fohhn–Net, which uses the RS485 standard, which is capable of working over long distances. Up to 32 devices can be connected together in star or ring configuration without switches or hubs. An NA11 USB adaptor or NA3 Ethernet adapter is required to connect the speaker to a computer if you want to control it via Audio Soft or do an update. Many lower–cost subs tend to rely heavily on an overly resonant port system to give the impression of more low end, the compromise being that notes around the port’s resonant frequency come over most strongly and also tend to get stretched as over–zealous porting causes significant low–frequency overhang. Fohhn’s subs have always impressed me by sounding tight and assertive while not compromising on sonic depth, and this can only be achieved through the use of top–quality drivers and electronics in a cabinet where the port/cabinet relationship is optimised to minimise overhang. All of the I/O and menu functions are accessed on the rear panel.There is an operational oddness that at first I took to be a fault, but on checking with Systems Workshop, and with Fohhn themselves, it appears to be ‘normal’ for their 10– and 12–inch subs (though it doesn’t apply to the larger models). It’s all down to the fact that the crossovers are in fact passive and there are only two amplifiers in the sub, and in single–sub stereo mode one amp drives the sub plus a top, and the other just a top. To get true stereo operation you need two subs, one of which may be passive. The practical outcome is that if you are using a system comprising two tops and a single XS22, and then pan a signal over to just one of the channels when in stereo mode, you hear what you’d expect, but if you then pan to the other channel you hear the top but with no contribution from the sub. While it is normal to have bass sounds in the middle of a mix — and such a strategy avoids phase issues when the low end is summed — it does mean that anything panned extremely towards the ‘no sub’ direction can start to sound unnaturally thin, especially if you’re using the smaller Linea line–array tops, as the crossover point is quite high. In practice this is not a problem if you keep your panning fairly narrow, but it is not a restriction I expected in a sub at this price. Apparently, you can have full stereo operation if you add a passive sub as that also includes a passive crossover. Other than that, the only real ‘tactical’ weakness is that having all the amplifiers built into the sub means that if you experience a sub failure in a single sub system, you’re left with no means to get through the rest of the gig unless you carry a spare amp capable of powering the mains. Having said that, Fohhn equipment has a good reputation for reliability, with design updates over the past few years making the electronics more tolerant of supply-voltage variations, but no electronic system can ever be guaranteed never to suffer a component failure. With two powered subs there’s always the option of feeding the tops from just one of them if one should fail on you, but to put this into perspective, failures are very rare. The XS22 certainly delivers a performance to match that of a much larger sub, while providing pristine power to the tops with the speaker controller section ensuring not only the correct crossover point but also the correct limiter threshold to match the power rating for the various main speakers. The lows are surprisingly deep for a 12–inch unit but still tight–sounding, and with a surprising amount of level available. Understandably, such quality comes at a price, and many musicians do a double take when they find out what Fohhn gear costs — you can buy a complete budget 2.1 PA system for less than half the cost of this sub. However, this has to be weighed against both the outstanding sonic performance and the reduced weight and size, which may mean you can get by using a smaller vehicle — and there’s less chance of putting your back out. Good-quality PA gear like this will last almost indefinitely if looked after — it is professional kit, built to last and designed to be serviceable. It’s definitely not a case of using it for two or three years, then throwing it away and buying a new one! Any competitors playing in the same league as Fohhn are likely to be equally expensive. d&b Audiotechnik, also originating from Germany, are one example. Compact and low in weight. DSP speaker–management system programmed with a range of main speaker parameters. Includes amplification for the mains. Having all the amplifiers in the sub is a bit ‘all your eggs in one basket’. No line–level high–pass-filtered outputs for feeding additional active main speakers. No true stereo operation in a single sub system. Other than the price, there’s nothing not to like. Fohhn make some of the best speakers I’ve heard to date yet they also manage to make them smaller and lighter than most of their competition. £2795 ($4137 approx). Pricing is per speaker.